The major waves of free agency have come and gone. The NFL transaction wire is suddenly a ghost town and all too quiet. That doesn’t mean more work isn’t needed. Just about every team has at least one major weakness they can’t feel comfortable with heading into 2019. With the help of our friends at Rotoworld and their up-to-date depth charts, we will look to identify one major weakness on each NFC team’s depth chart heading into the draft. We will also look at a possible solution for addressing it in the selection process a few weeks from now. You can check out our piece on the AFC here. The Cardinals still have more work to do on their offensive line — don’t get that twisted. However, if they truly intend to buy into the Kliff Kingsbury experience and play with air-raid concepts, they’ll need better depth at the wide receiver position. When you’re having to put out puff lines about Kevin White in the year 2019, you know you’re in trouble. If all things work out, the two starters are solid but both Larry Fitzgerald (age) and Christian Kirk (rookie foot injury) have question marks. At best, Arizona at least needs some more depth for their 11 personnel packages and four-wide sets. At worst, they need to find better options for the future. The Cardinals looked poised to take Kyler Murray at the top of the draft. If that comes to pass, expect them to focus on adding a possible weapon on the second day to accompany their new prized passer. With Fitzgerald and Kirk the likely 2019 starters, Arizona needs someone to contribute outside and down the field. Look for players of that ilk. Issues on the offensive line were a sneaky anchor for the Falcons offense in 2019. The run blocking was poor, with Atlanta checking in at 24th in Football Outsiders’ adjusted line yards metric, and the pass protection wasn’t a top-half of the league operation either. The loss of Devonta Freeman stung the run game all year but a better push from the line would have helped. Matt Ryan needs better protection to unlock the peak of the enviable set of wide receivers he has in Julio Jones and Calvin Ridley. Current right tackle starter Ty Sambrailo is a journeyman who played just 299 snaps last year. The Falcons need better competition at that spot. Don’t rule out the Falcons taking offensive line reinforcements at the 14th overall pick in April. While needs in the trenches exist on the other side of the ball, good players like Jonah Williams and Andre Dillard will tempt them. Division rival Carolina will also be in the hunt for an offensive tackle in that area and Atlanta could remove a player they like mere picks beforehand. The Panthers offense sputtered after a strong start, thanks in large part to Cam Newton’s shoulder issues becoming increasingly worse. Plenty of work needs to be done in order to protect Newton from further damage and extend his prime years, but it starts up front. The offensive line Carolina fielded last season simply was not good enough. Taylor Moton was a strong starter in 2018 and should be locked into one of the two starting spots. After missing most of 2018 with injuries, 2017 All-Pro selection Daryl Williams re-signed with the Panthers on a modest one-year prove-it deal. Williams was a fine player but boosted by some chips and help during his All-Pro season. Carolina has to bring in more competition at this spot and take a possible good season from Williams as gravy. The Panthers own the 16th overall pick in the draft and should be in prime position to snag a tackle prospect like Andre Dillard or Jonah Williams. It’s rare a team locks in on a position group in the draft but this line needs major help. The Panthers could find their long-term left tackle in April and then keep Moton at right tackle. Williams would then become solid depth and could even be moved to guard to compete with Greg Van Roten as a starter. The Bears are so strong personnel-wise on offense, it’s this luxury position that looks like their biggest weakness. 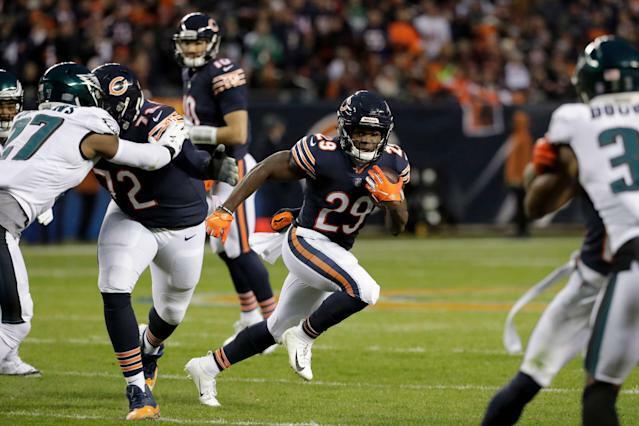 You can rationalize the Bears trading Jordan Howard, a predictable asset on an offense that wants to be multi-dimensional, but there’s no denying they just shipped off a great pure runner. The team may like Mike Davis in an early down role that brings more pass-catching possibilities than with Howard and Tarik Cohen chipping in, but another rushing option could help. Chicago is not flush with draft resources, as they do not have a pick in the first, second or sixth round. However, we’ve seen rookie backs rise from Day 3 picks to be become valuable contributors right away (think Jordan Howard himself). Don’t rule out the reality that the Bears may take a back with two-way ability in Rounds 4 or 5, and we end up talking about him as a fantasy sleeper come August. Dallas actually boasts a solid core on offense and doesn’t have a ton of glaring needs as it did in years past. At the same time, their offensive line may come with more question marks than ever before. Not only could they think about a future starter at tackle with Tyron Smith aging, but there are also pressing issues on the interior. Travis Frederick missed all of 2018 and while reports sound positive for his return this coming season, we’re in the wilderness with his particular medical malady. They could look to upgrade on Joe Tooney behind him. Left guard doesn’t have a locked-in starter at the moment. Xavier Su'a-Filo is far from a solution and Connor Williams was not promising as a rookie. The Cowboys sacrificed their first round pick for the rights to Amari Cooper. They don’t regret that move. While most of their six remaining picks will likely go toward the defense, we should expect at least one pick in Rounds 2 to 4 to go toward the offensive line. The release and subsequent retirement of T.J. Lang leaves the Lions with a glaring hole that, admittedly, they played with for most of 2018. Nevertheless, this Detroit brass has signaled for some time that they want to be a run-based attack. Continuing to fortify an offensive line whose sum has too often been weaker than its parts. The Lions will almost certainly make a move to address their hideous defense with the eighth overall pick. Edge rushers will be plentiful in the top-10 and they’ll be looking for a longterm running mate for Trey Flowers. After the first round, the Lions should supplement what will certainly be more defensive selections with investments in the offensive line. Jimmy Graham is back after one underwhelming season with the Packers. He is still capable enough to start at tight end but the team ought to have one eye toward the future. After staying out of the free agent wide receiver market it looks like Green Bay may go into 2019 continuing to count on their rookie wideout crop from last year, although it’s likely they draft another. With no veteran presence outside of Davante Adams, the team could look to incorporate more multi-tight end sets, which Matt LaFleur used on 39 percent of his plays as the Titans offensive coordinator in 2018. Green Bay checked in under 18 percent. The Packers need to supply Aaron Rodgers with more weapons as he enters the twilight of his career. Period. That could come in the form of a first-round wide receiver at either pick No. 12 or 30 (more likely). However, this is a strong tight end class up at the top and the Packers could spend one of those picks at the position. Two-way tight end T.J. Hockerson could be a slam dunk pick if he makes it to 12, while his former teammate Noah Fant or Alabama’s Irv Smith could make sense at 30. The Rams offensive line showed up as a weak point in pass protection as the year went on and especially in the postseason. Most of the issues lay with the interior during that stretch and the situation is markedly worse today. Los Angeles lost Rodger Saffold in free agency and let go of veteran center John Sullivan. Players like 2018 third-round tackle Joseph Noteboom and fourth-round center Brian Allen may be able to replace those departed players but the Rams would be wise to consider adding competition. Mock drafts frequently have the Rams drafting a defensive asset at pick 31 or even doing something ridiculous like drafting a running back after getting starting caliber in-their-system play from C.J. Anderson off the street. Les Snead and company may very well do neither and snag a front-five starter here. Offensive line play has been critical to the Rams success thus far in the run game but also through the air. Jared Goff maintained a 59.8 passer rating when under pressure compared to 117.1 when kept clean (fourth-best among starters) in 2018, per Pro Football Focus. The Rams could look to fortify his protection with a player like Cody Ford or Dalton Risner at the bottom of the first round. The Vikings have signaled they want to be a run-based team after an influx of Gary Kubiak-centric hires in the offseason. If that’s the case, they’re going to need to be a whole hell of a lot better up front than they were in 2018. Minnesota was an abysmal rushing team last year thanks in large part to an offensive front that ranked 23rd in Football Outsiders’ adjusted line yards metric. With a top to bottom adopting of the Kubiak zone rushing attack, expect the team’s personnel moves on the line to reflect that. Minnesota gave former Titans guard Josh Kline a three-year, $15.75 million contract, so he looks locked into a starting spot at guard. The 24-year-old Pat Elflein may get another shot at manning the pivot but has not been a success so far. The Vikings will definitely look to add at least one other body to the mix to compete for a starting left guard gig. It could come as early as 18th overall in the form of Cody Ford or Chris Lindstrom. If they're looking at center to replace Elflein, Garrett Bradbury of NC State could go in their range. The Saints are pretty well set on offense, plugging their most glaring hole in free agency by signing Jared Cook. You could argue they need to sink another pick or two into the offensive line after Max Unger retired a few waves into free agency. However, they signed Nick Easton almost immediately after and they likely view that as enough and could stand to restock their wide receiver corps. The Saints have three interesting options behind Michael Thomas but each comes with a major question. Ted Ginn: How close is the cliff? Cameron Meredith: Will he ever recapture his pre-ACL tear form? Tre’Quan Smith: Can he be more than just a spot player? Smith presents a nice opportunity for future growth but more alternatives would keep this passing offense juiced heading toward the end of the Drew Brees era. With just one pick in the first four rounds of the NFL Draft, it’s unlikely the odds are against the Saints adding a player who will contribute major offensive snaps in 2019. The wide receiver class is strong enough that they could snag a possible starter in Round 2 like Parris Campbell or Miles Boykin. Nevertheless, don’t be shocked if they run it back with the 2018 group and hope all three of their questions are answered with a positive note. Given everything we have heard out of the Giants camp the last year, this is probably a fruitless exercise. A waste of my time and yours. But come on, Giants. It doesn’t have to be this hard. You have a top-six because your quarterback is hovering below replacement level and has seen his physical skills erode rapidly each of the last few seasons. You don’t have a roster capable of masking him. Just get someone in the building fans can believe in without your disingenuous attempt to make a case for, as you’re doing with Eli Manning. You have the sixth overall pick. Pick your favorite passer at that spot or move up with a package that includes your second first-round pick. It doesn’t have to be this hard. The Eagles patched up their most glaring weakness by trading for Jordan Howard on a cheap contract with little draft equity spent. Most of the other spots on offense are locked-in with above-average starters. The offensive line could use a bit more juice on the interior. Brandon Brooks is a great player but went down with an Achilles tear in the postseason and could start camp on the PUP. Issac Seumalo proved capable and a strong reserve but could be upgraded on despite getting a contract extension. The Eagles could look to boost their line play toward the end of Round 1 but seem more likely to flush their broken secondary with more talent. With two second round picks in hand, Philadelphia’s next offensive line competitor could be found on Day 2. The majority of the receivers on the 49ers depth chart would find their best success as slot players. Dante Pettis and Marquise Goodwin are the only two who are likely to be starting caliber outside receivers, and even Pettis may be best suited for a hybrid role. The 49ers have an enviable collection of backs and one of the three best tight ends in football. The last thing to take Jimmy Garoppolo’s skill position group over the top would be a high-flying X or flanker receiver. San Francisco won’t take a receiver at the second overall pick but may well have one on their radar at the top of Round 2. Miles Boykin would be an ideal option as a vertical X-receiver. If they want to add another versatile receiver to alternate between the flanker and slot with Dante Pettis, A.J. Brown or N’Keal Harry could slide right into those positions. The Seahawks want to be a run-first team (for whatever reason) and carry a major weakness in their pass-catch corps. Tyler Lockett is a star but Doug Baldwin’s injury issues are beginning to add up with age. There isn’t much to get excited about behind them, outside of David Moore who flashed in 2018. The tight end group is even worse and inhabited by nothing more than bit players. Given how much they want to run the ball, tight ends could find success in the play action game over the middle of the field, especially on boot plays with Russell Wilson. Seattle could choose to eschew some defensive needs and dip into the pass-catching market in Round 1. A vertical wide receiver like D.K. Metcalf would look nice with a creative passer like Wilson, as would a modern tight end like Noah Fant. His blocking is undersold given the prototype of his style of tight end and he could gobble up 80 targets right away in the open space cleared by Lockett’s deep game. Few running back depth charts look as uninspiring as Tampa Bay’s right now. Peyton Barber has proven competent at the NFL level but doesn’t individually move the needle. Ronald Jones showed nothing as a rookie that would lead a new Bucs coaching staff to believe they can count on him as a starter. Bruce Arians could be hunting for his next starting running back in Round 2 or later this April. Taking a running back at No. 5 overall in a weak year for the position and with how much rot has infected their defense would be a wild move. On Day 2, Tampa Bay could look for a back like Damien Harris, David Montgomery or Miles Sanders as possible players to come in and compete for a spot atop the depth chart from the jump. Washington has a lot of problems. The most frightening among them is the worst quarterback situation in the NFL when you consider Alex Smith’s albatross of a contract will be on the books whether he takes a snap this year or not. That isn’t likely. Neither Case Keenum or Colt McCoy has a realistic case to be a starting quarterback at this point of their careers. While they should be bridge quarterbacks, if it’s just the two of them, this bridge leads to nothing but a pit of fire with weeping and gnashing of teeth. Washington needs help today. Washington needs hope for tomorrow. A better than zero percent chance exists that Dwayne Haskins falls to Pick 15. Drew Lock could also be there. The only possible first-round quarterback who has a strong chance to fall to their selection is Daniel Jones. He seems like the type of Andy Dalton-adjacent quarterback Jay Gruden has preferred in the past. If Washington decides Jones isn’t a sizable upgrade on the Keenum/McCoy tandem of sadness (and they may well be right), they will likely just end up taking a Round 3 or later quarterback. In that scenario, the 15th pick may go to a wide receiver to clean up what is another messy spot on the depth chart and attempt to mask their lacking quarterback room. When that doesn’t work, they’ll draft a quarterback next year ... we hope.